Spring Cleaning Checklist For Busy Moms: Print this 25 Day Checklist to get your whole house clean naturally! Full disclosure: Some of the products linked are affiliate products. I also will reference Norwex cleaning products (I own them but am not a representative), I do however currently belong to Young Living, so you will see these products mentioned as well. Wherever I can, I will link to products I use and love on Amazon. Even with using our Daily Cleaning Schedule for Busy Moms, our house needs a Spring Clean once in awhile! 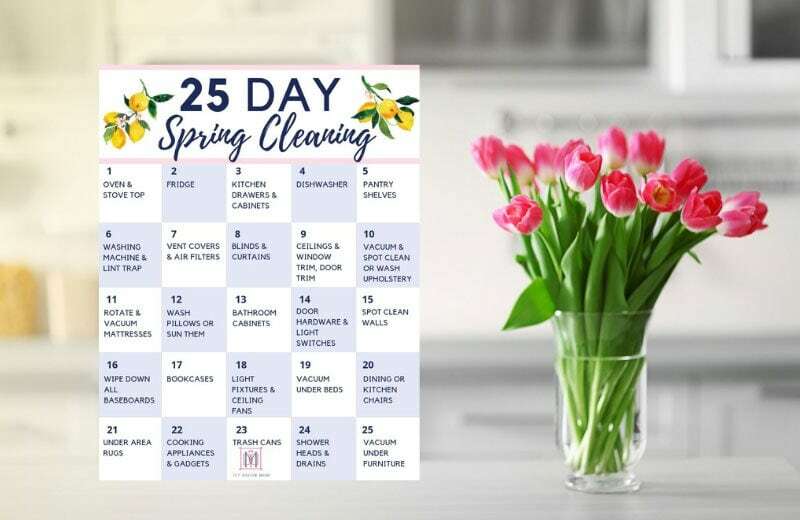 This actionable day-by-day 25 task Spring Cleaning Checklist will make spring cleaning doable even for the busiest of moms! Below, I’ve outlined all the tasks but make sure to print out your calendar so you can cross off the days with me! It makes it so much more rewarding! 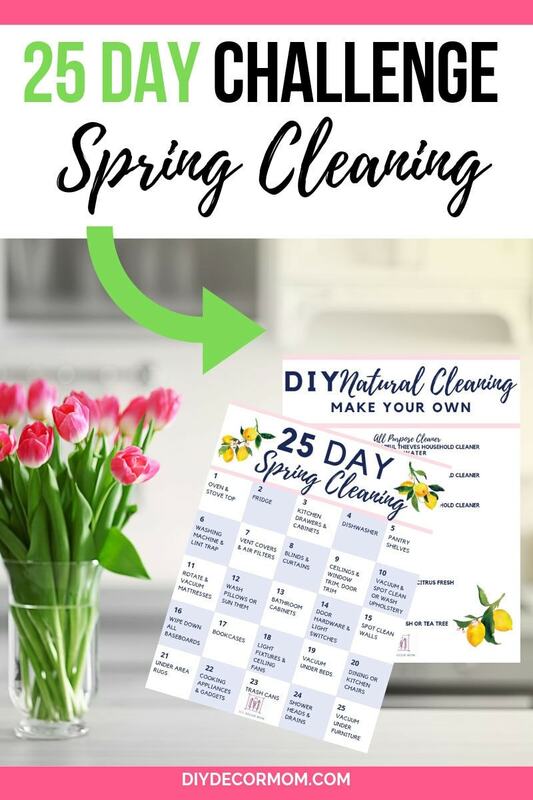 PLUS, you’ll get a printable of all my natural cleaning recipes so you can make them yourself AND a non-toxic checklist for each room of your house. Making these little switches will help you make your home a healthier and happier place for your family! Oven & Stove Top: Time to clean that oven! Fridge: Time to empty and wipe down inside your fridge, and outside! Wipe down the outside of the fridge with Norwex enviro cloth and Norwex Cleaning Paste, going in the direction of the stainless steel. Rinse and wipe down to get paste residue off. Vacuum off the top of the fridge and wipe down with microfiber cloth as well. Wipe down the inside and outside of your kitchen cabinets and drawers. Use a vacuum to get all the crumbs out if necessary (this is my favorite tool by far)! Use a damp microfiber cloth and spray Thieves All Purpose Spray to clean and disinfect the inside of drawers. Wipe down the outside of drawers and handles using Thieves All-Purpose Spray and Norwex Cleaning Paste with a microfiber cloth to get any tough marks off! Dishwasher: Your dishwasher works hard, now you need to clean it to keep it working! Put 1 cup of vinegar in a cup on the upper rack of your dishwasher. Run the dishwasher through a hot-water cycle. This will remove build up. Lastly, take the strainer out of the bottom of your dishwasher and soak it in hot water and vinegar. I scrub it then with an old toothbrush to get any buildup that remains. Pantry Shelves: Be ruthless! Empty your pantry shelves and wipe them down, discarding any expired products. 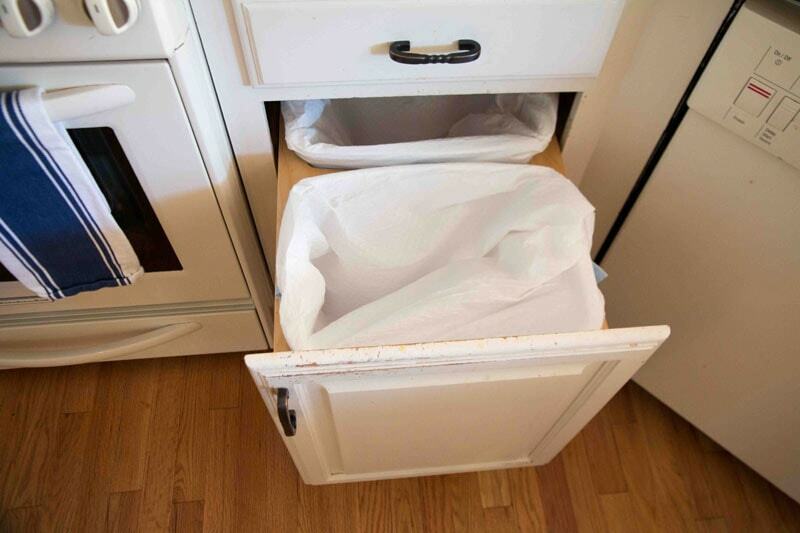 Pull a trash can and recycling bin right up to your pantry so it’s easy to get rid of expired products. Use a microfiber cloth with Thieves All Purpose Spray to wipe down cabinets and inside of drawers. 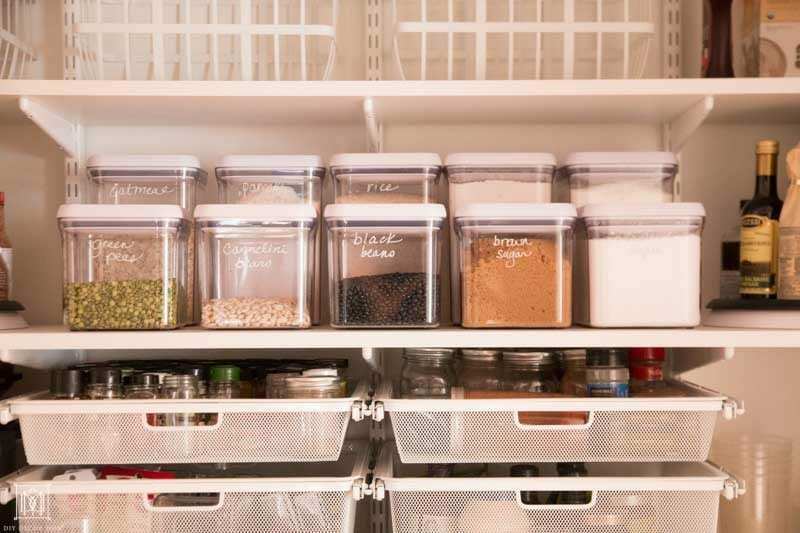 Want to see how to organize a deep pantry? See my pantry makeover here! 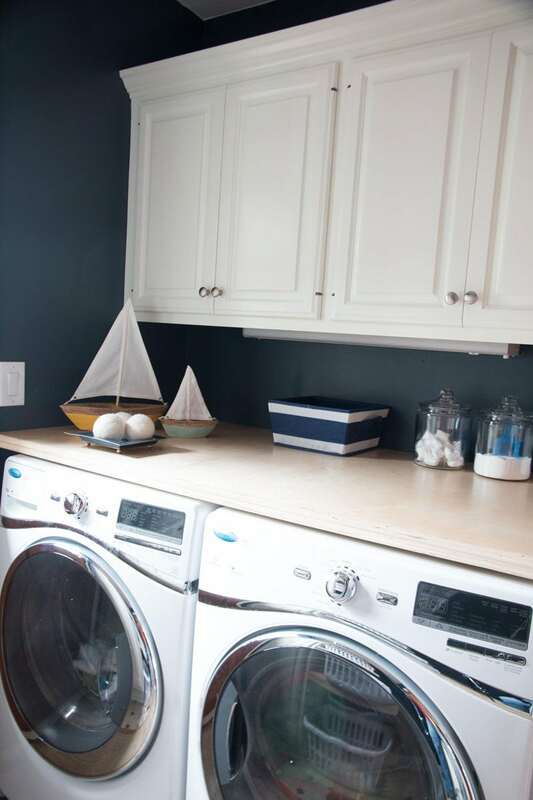 Washing Machine and Lint Trap: Chances are your washing machine is actually quite dirty! See how to spring clean your washing machine below. Add 3/4 cup of vinegar to the bleach dispenser and select the hot water setting. Select extra rinse if your washing machine has the option. After it runs, open the washing machine and wipe down the inside of the door, the inside walls, and the rubber ring removing any debris, hair, or soap scum using Thieves All-Purpose Spray or a vinegar wash. Vacuum out your lint trap. If you have a Norwex Envirowand, you can also use that to clean the inside of your lint trap. See this post on how to fix a smelly wash machine! Vent Covers and Air Filters: Time to change out your air filters and vacuum those vent covers! You should change your air filters every 3 months, which is hard to remember. HANDY TIP: But you can set a reminder on your iPhone easily. I like changing them on the first of the month. January 1st, April 1st, July 1st, and October 1st! Wipe down with a damp microfiber cloth and Thieves All-Purpose Spray your vent covers–chances are they are pretty dusty! Blinds and curtains often are the first thing that get dirty when windows are open, and the last thing that gets cleaned! Take a microfiber (Norwex envirocloth is my favorite) or Norwex dusting mitt to all of your blinds. Next, get your vacuum and set it to upholstery setting. Gently vacuum your curtains (or at least take them off the curtain rod and let them air out in the sun). A good shake should release most of the dust. 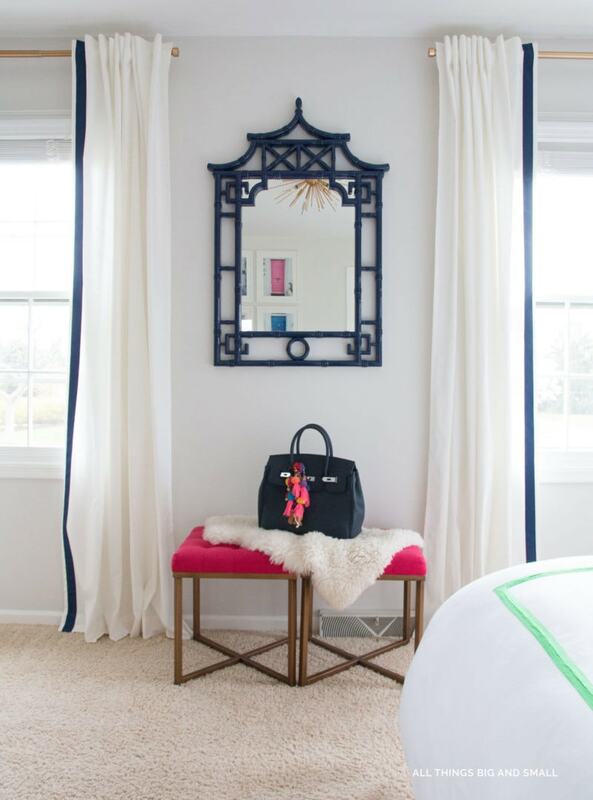 Wipe down the top of your curtain rod–it’s really dusty and is often neglected! Take your vacuum with an extension, and dust away any of the cobwebs in your corners. I also use my Norwex mop with the Envirowand to reach the highest corners of my house. Wipe down the tops of door trim and window trim with a damp microfiber cloth and All-Purpose Spray. You’ll be horrified at how much dust is up there! Time to clean your couch and your chairs! NOTE: If your furniture says dry clean only, I do not recommend doing the following process. I use this steam vacuum cleaner with 1 capful of Thieves Household Cleaner and the rest of the reservoir filled with water. I have also used 1 scoop of Charlies Laundry Detergent with 1 tablespoon of Norwex Carpet Stain blaster with a full reservoir of water, and had great results as well! Fully dry any pieces of upholstery you wash by laying them out in the sun or putting a fan on them. Your mattress should be rotated every few months, but most of us forget. This is another thing you can easily do by setting a reminder on your iPhone. 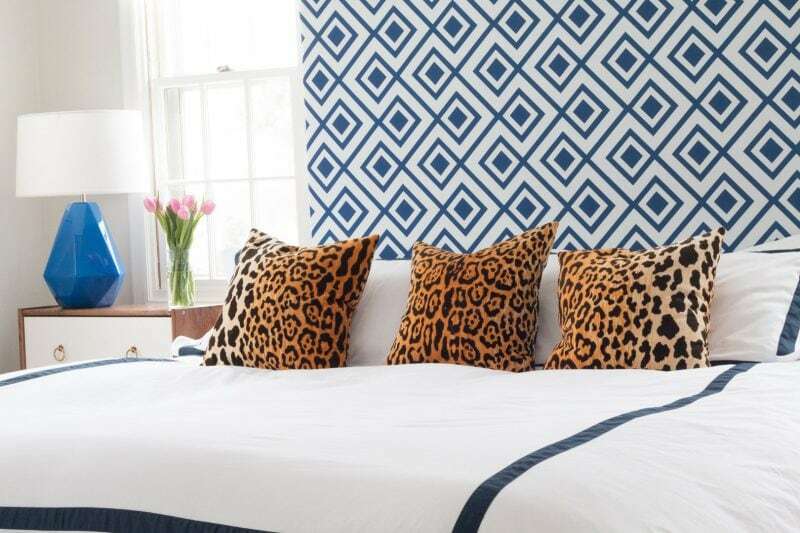 HANDY TIP: Rotate and clean your mattress the same day that you switch your air filters! After stripping your bed (including washing the mattress protector), vacuum the bed. Next, spray Norwex Mattress Cleaner on the bed as directed. Let it sit for four hours. The enzymes are acting to kill all the dust bunnies caught in your bed. Time to put on a nice clean mattress protector and new clean sheets! Wash Pillows or Sun Them: Are your pillows a little deflated? One of my favorite tips for fluffy pillows is washing them regularly. This also helps manage dust bunnies. We have down pillows in our house, and although they are really expensive, I feel like they are a good investment. I am comfortable washing them in our washing machine; but, do what you are comfortable with! I use a gentle natural laundry detergent (either Charlie’s Laundry Detergent or Thieves) with our down pillows but have used this laundry detergent before on them with good results. Place the still damp pillows in the dryer with two to three wool dryer balls. Dry for three hours. Then place in the sun for several hours. This will kill any dust bunnies! You can also spray them monthly with Norwex Mattress Cleaner to kill dust bunnies! Bathroom cabinets are one of those things we use and forget to clean! Take this chance to wipe down the interior and exterior of all your bathroom cabinets! Throw out expired or make not of duplicate products–I had five bottles of children’s shampoo and body wash! Take a damp microfiber cloth with Thieves All Purpose Spray to the inside of the cabinets and outside of the cabinets. Note if there is any musty smell. We store our bath towels in our bathroom and have never had a moisture issue; but, if your bathroom does have one, think about installing a cedar board or relocating your towel storage. Need more bathroom storage? 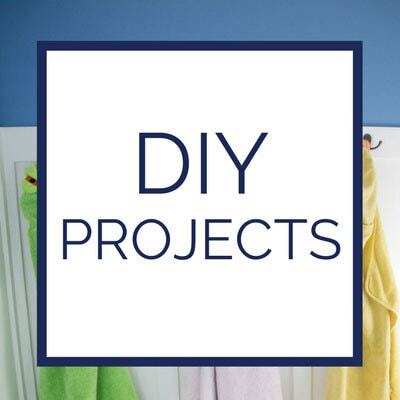 See my DIY Bathroom Shelves Ideas here! Think your toilet is the dirtiest part of your house? NOPE! Most likely it’s the kitchen sinkn or your door hardware and light switches! It’s time to clean them and get rid of all of the grime and bacteria! Take a damp microfiber cloth (I use my Norwex envirocloth) and Thieves All Purpose Spray to wipe down all the light switches and door handles in our house. With white walls (or any color walls for that matter) little handprints can quickly mar the surface. Wipe down any and all walls that look dirty or have scuff marks. 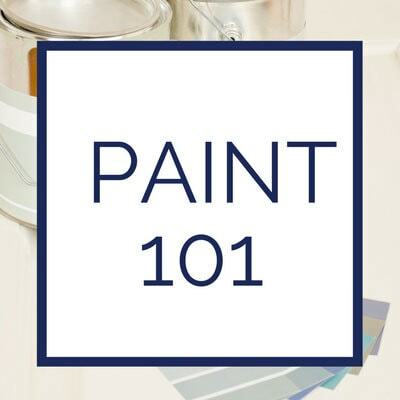 Use either a magic eraser or my preference, Norwex Cleaning Paste–it’s gentle enough not to scratch off the paint; yet, gritty enough to get off all the scuff marks. I use it on my baseboards as well. 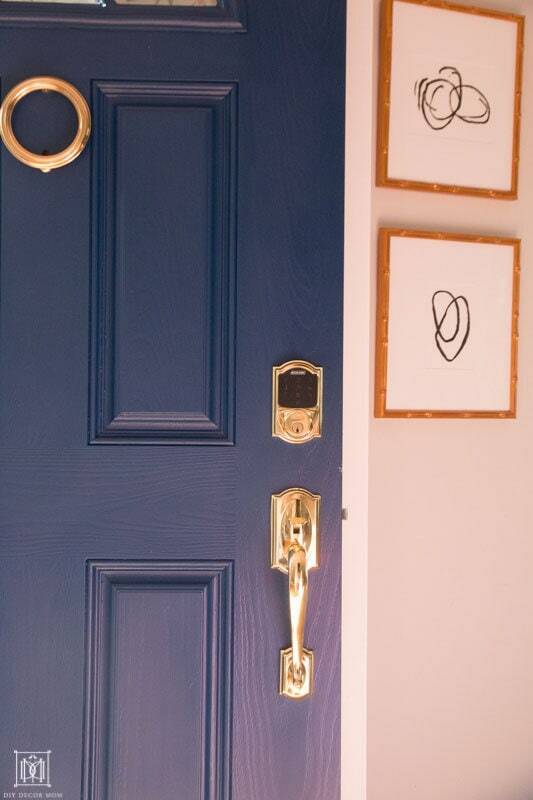 You probably spent a lot of time painting those baseboards a bright white (or is that just me?) Now it’s time to get them looking clean and spotless again! My daughter will often dust the baseboards in our house for chores (she is six years old); but, every once in awhile our baseboards and toe-kicks (in the kitchen) need a thorough washing. Take a damp microfiber cloth with Thieves All Purpose Spray (or water if you’re using Norwex–it’s unnecessary to use the essential oils) and/or Norwex Cleaning Paste to clean those baseboards. I like to use my Norwex Dusting Mitt for dusting, but once in awhile (especially during Spring Cleaning) I will get it really clean with a damp microfiber cloth. Use a vacuum on upholstery settings or a microfiber dusting mitt to dust the tops of books. You will be amazed at how much dust is hiding on top of your ceiling fan blades or even your light fixture! 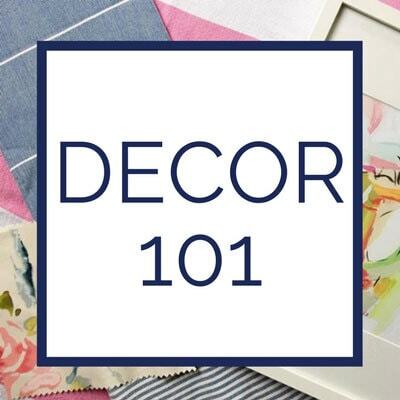 Turn off the light fixtures and either use a delicate dusting wand (make sure it is microfiber so you aren’t just moving around the dust) and/or vacuum (for fan blades) to remove the majority of the dust. Then wipe it down with a damp microfiber cloth and Thieves All Purpose Spray. EEKS! If you have a hardwood floor under your bed, you will easily be able to see the number of dust bunnies living there! With carpet, it’s a little harder; but once you run your carpet over the place you will be amazed at the amount of garbage it pulls up! Vacuuming under your beds is easier said than done. Depending on your vacuum, it may or may not fit under your bed without you moving it. So grab a friend if you need one (or your husband), and have them give you a hand. A thorough vacuuming is worth the work! 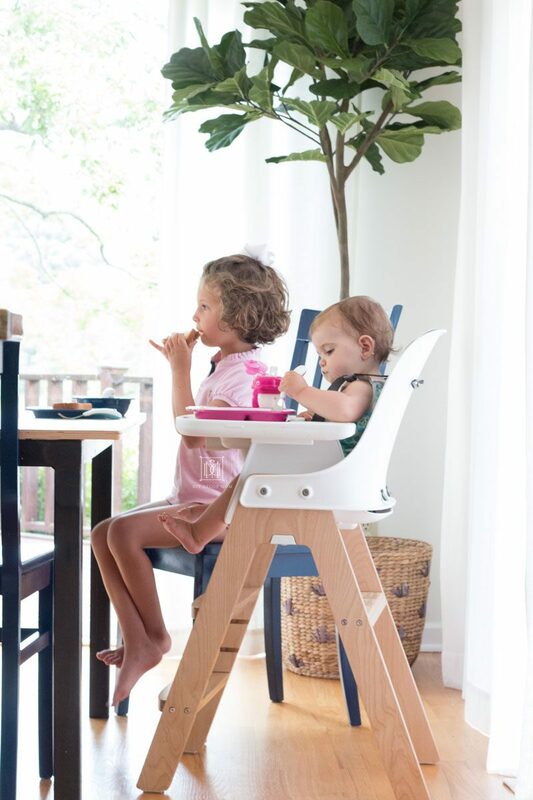 If you have kids you know how dirty dining and kitchen chairs can get–and don’t get me started on high chairs! 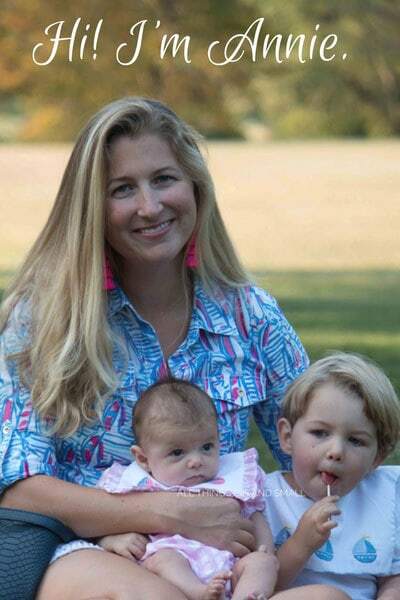 (See my tips for easy to clean high chairs here–which I do every Sunday). Vacuum (if necessary) and then wipe down with Thieves All Purpose Spray to clean all the spindles, legs, and seat of any chairs. HANDY TIP: Replace any chair glides if necessary at this time too! We have wall to wall carpeting throughout our entire upstairs, and half of our downstairs, so I only have one or two area rugs. If you have more, this is more of a necessity as they are harboring lots of dust bunnies. First, vacuum under them making note of any irregularities with your rug pad. Second, wipe down with a floor cleaner (I just use my Norwex mop and water, and Thieves All Purpose Spray) to clean the floors underneath. Let dry! When was the last time you cleaned your toaster oven? We clean our microwave weekly; but, our coffee machine and toaster oven need to be cleaned less often (and are often neglected!) Time to get them clean! Unplug your appliances from the wall. Then wipe down the exterior with a damp microfiber cloth and Thieves All Purpose Spray. For your coffee machine, if you have a lot of buildup on the inside of the pot here’s the easiest way to clean it! Let it sit 45 minutes and then rinse out! The build-up should be gone! We don’t use plastic bags in most of our trash cans upstairs (I just empty them a couple of times a week into the kitchen bag to save on plastic), and then I rinse them with water and a spray of Thieves All Purpose Soap to keep them clean. However, in our kitchen, we use garbage bags for the recycling (I just empty the bag into the recycling can and reuse the plastic bag) and our main garbage. While we would like to use paper bags, it just isn’t doable for our family right now. Alright, this one is kind of gross–but it’s necessary! If you have long hair like me, you most likely have to do this more than once a year but maybe you don’t! Unscrew your shower drain and pull it up. You are going to find lots of hair and soap residue down there. While it’s not necessary for this to be spotless, I like giving it a once over. Spray a vinegar solution or some Thieves All Purpose Cleaner down your drain, and wipe out white you can–throwing out the likely huge ball of hair. Wipe the bottom of the drain and the top. Shower heads: Wipe down the top of your shower heads, and the holes. You are likely to have some kind of mineral build up on them–so using a vinegar solution is sometimes helpful. I just use a microfiber cloth with All-Purpose Spray; but, if you have hard water you might need something stronger. After vacuuming, wipe down floors so they are clean. Use this chance while your furniture is moved away from the wall to wipe down any baseboards you couldn’t access before! You might also like: Daily Cleaning Schedule for Busy Moms–print out the weekly calendar! I am a Young Living distributor. WHY? 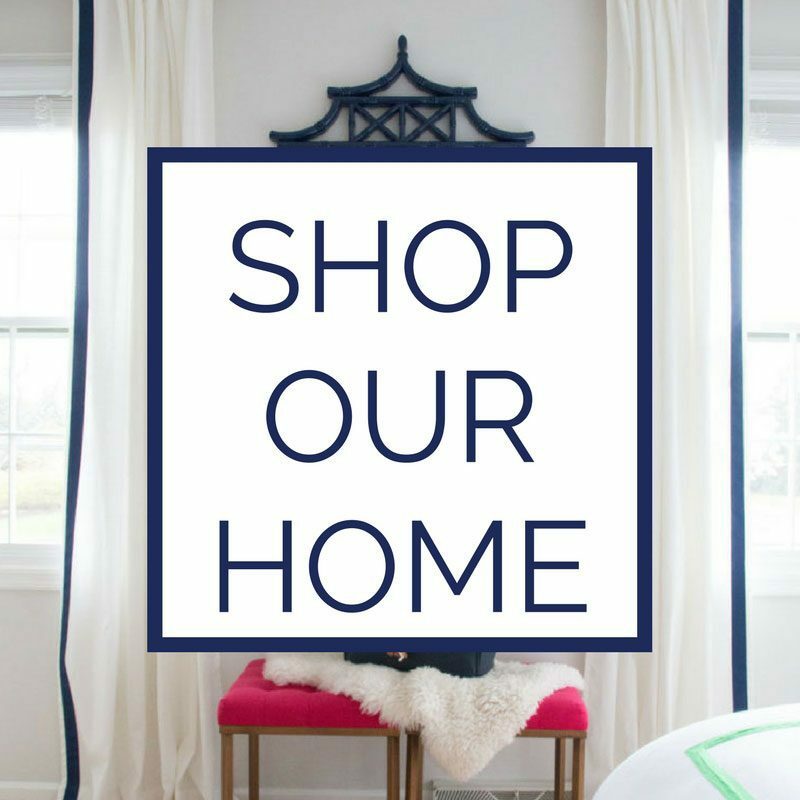 Because I love using nontoxic ways to clean my home and support my family, and after joining as a member I get a 24% discount on everything. When you sign up as a member of Young Living you can get 24% off their prices too–and you DON’T have to sell anything ever! By becoming a member (CLICK HERE), you will get a starter kit. Make sure the sponsor/ enroller number is 3600425. Getting the Starter Kit is the best way to save on oils and get a quality diffuser. You will get everything you need in your Starter Kit! And if you sign up using my member number, I will personally send you a few goodies as well to start your routine and invite you into our private Facebook Group! You can print all of these cleaning recipes out by clicking on the button below! 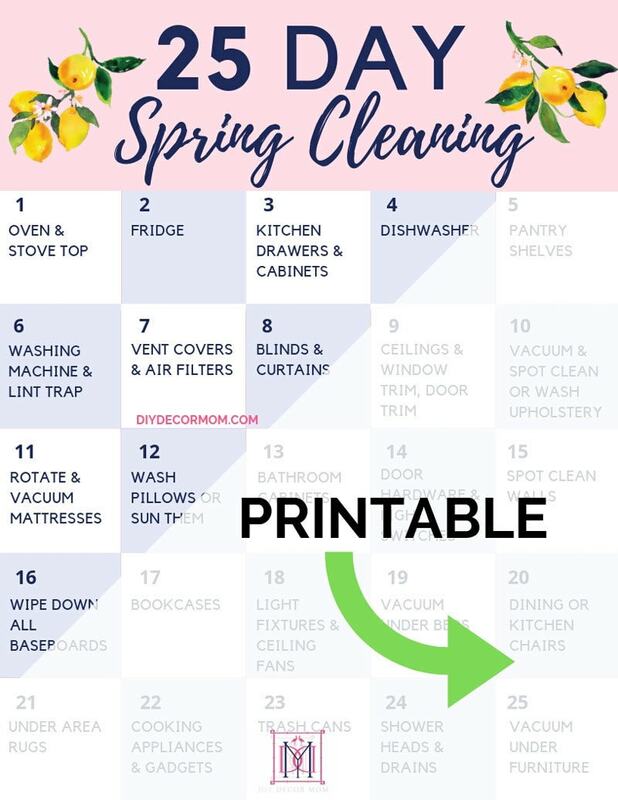 Plus, you’ll get the 25 day calendar for Spring Cleaning! I use this spray everywhere in my house–on my countertops, my bathrooms, my floors (if necessary). I just don’t use it on my antique wood furniture. This is the all natural carpet cleaner I have used on Insta-stories to clean my wall to wall carpets and my upholstery. If you don’t have these supplies, you can also try it with Charlie’s Laundry Detergent (1 tablespoon) and fill the rest of the reservoir with water! A capful of Norwex Carpet Stain Blaster is helpful but not necessary. If you use Norwex enviro cloths and a polishing cloth, this is unnecessary but if you don’t have them, this essential oil glass cleaner does the trick! 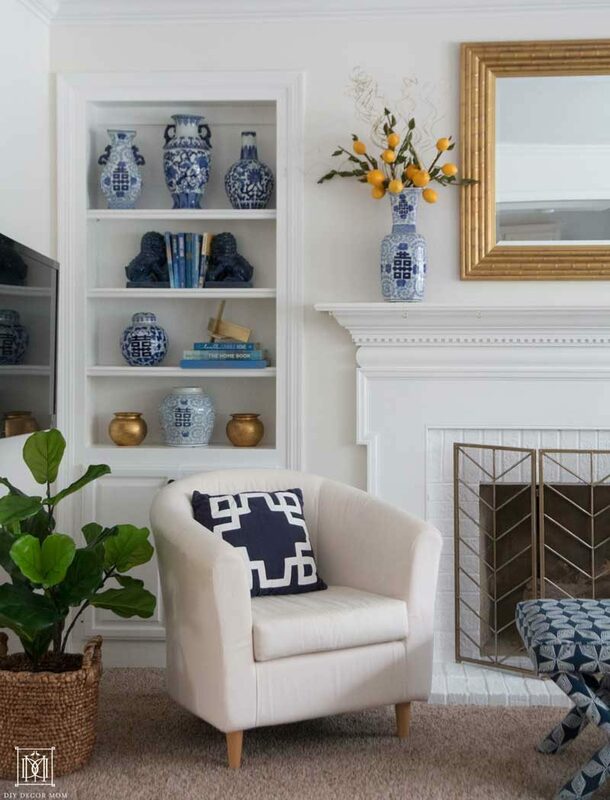 Don’t miss: How to Keep Your House Smelling Good ALL THE TIME! If you’re interested in the natural lifestyle, follow me on Instagram: @DIYOILSMOM for all my favorite oily and natural living tips! Loved the tip about placing your pillow in the sunlight, I need to do that ASAP! Just wondering if you need any wash instructions for them? 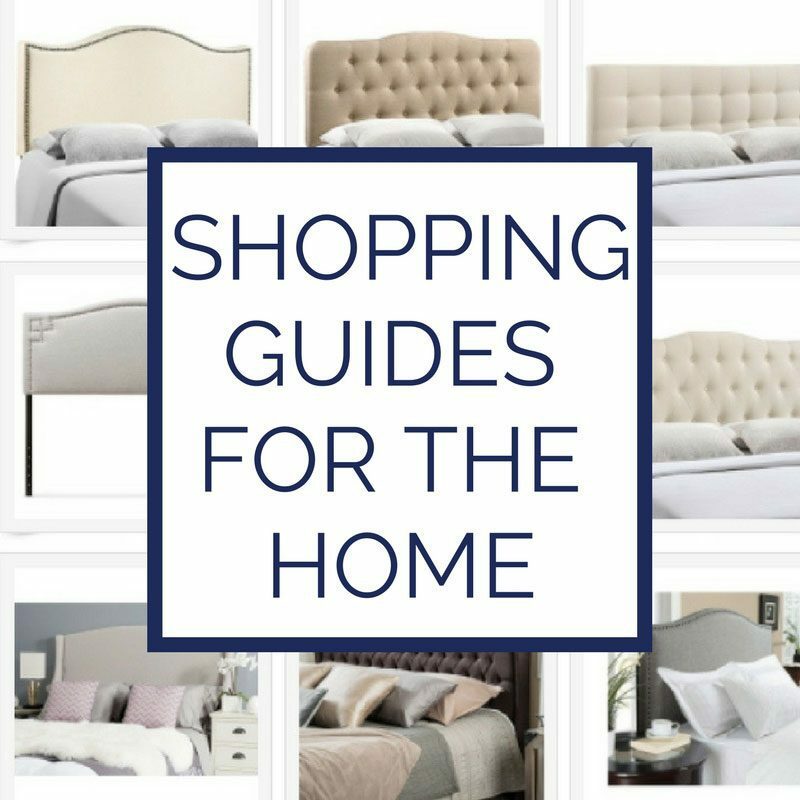 I have a page on my site your readers might find helpful 🙂 Hope it’s alright that I asked.